Now that I've had a few days to spend with the Windows Phone 7 prototype device, I'm personally having some of the WP7 "glow" wear off - that happens with every new gadget though, and I'm glad it does, because it allows me to be more objective about what works well and what doesn't. Something I've noticed today after making and receiving about 10 calls in total: I really miss having a hardware button for the phone. With every single Windows Mobile/Windows Phone I've had over the years, there's been a physical button to end the call, and a physical button to start a call. That speed of access has been important, especially when it comes to ending a call. When a call ends, I'd immediately take the phone away from my face, press the call end button, and put it in my pocket in one motion. 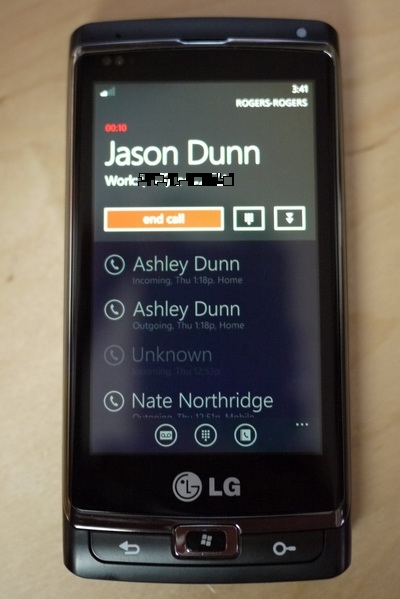 When a call ends on Windows Phone 7, I take it away from my face, wait about 1.5 seconds for the screen to go from off to one, then tap the End Call button. It's not a very big button, and the fact that I have to wait for the screen to turn on is irritating. This isn't a deal breaker, and maybe for one-button phone users (iPhone, etc.) this is normal, but for me it seems sub-optimal. I thought initially that there must be a better way - surely one of those three buttons re-maps to perform another function when the phone is in call mode - but, nope, all three buttons hold their original function. That's probably a good thing overall, but it does make ending a call more of a process than it should be - it doesn't feel fast or fluid. Another thing I'm not fond of is how the reminder snooze function works - my reminders trigger 30 minutes in advance by default (that's something you can configure in Outlook), but often I don't need to leave until 15 minutes before some appointments. Ideally I want to snooze the reminder for 10 or 15 minutes, or even five minutes before the start of the appointment if it's a conference call. The snooze function is hard-coded to five minutes though, so every five minutes I have to snooze the reminder. The current system is too binary and simplistic - I'd like to see, at minimum "5 Minutes before Start" added as an option that would be remembered. On the plus side, the integrated Bing search is just killer. I was downtown today, and wanted to stop at a local store called The Camera Store. I pressed the search button, typed in "camera store", two seconds later the results showed up (I was already on the Local view), I tapped on the first result, then tapped the phone number. That's stupid easy and incredibly fast. That level of integration is superb and shows off what happens when a company that owns a search engine and a mobile OS think hard about how they should work together. Also worth noting: the integration of multiple sources of information for a contact (Facebook, Windows Live, Outlook) is very slick. When you look at the contact details, underneath some pieces of info - such as birthday - it tells you what the source of that info is. It's smart enough to handle duplications as well - somehow I was one day off for my wife's birthday in Outlook, but the info was correct in Facebook - so it shows me both. Nice! That's it for now - more later...there's some ugliness with the Zune music client that needs some explaining. Jason Dunn owns and operates Thoughts Media Inc., a company dedicated to creating the best in online communities. He enjoys photography, mobile devices, blogging, digital media content creation/editing, and pretty much all technology. He lives in Calgary, Alberta, Canada with his lovely wife, his wonderful son Logan, and his sometimes obedient dog. He's thankful his MVP lead worked hard to get him a loaner Windows Phone 7 device for a week. Just my .02 on the end call issue. I use a BT headset and the answer / end button on it would be my way of hanging up.. although I agree that the lack of hardware buttons is a poor choice. I really miss having a hardware button for the phone. With every single Windows Mobile/Windows Phone I've had over the years, there's been a physical button to end the call, and a physical button to start a call. That speed of access has been important, especially when it comes to ending a call. I've been moaning about this for a while, if you've noticed. This isn't just WP7, it's just about every modern smartphone out there. It might not be so bad if the software were more finger friendly and the call screen appeared immediately after the call...I prefer hardware buttons, but I think it could be OK if the software were better. Once WP7 has been out for awhile and people start hacking it they may find a way to fix this. In Windows Mobile there was away to change the delay in ending a call. If memory serves me correct is was 2 seconds, and you could take it down to a half second if you wanted to. ... which is exactly what the iPhone does. It's fast enough (fraction of a second) that when you lift the phone from your ear, the screen's on by the time you get it anywhere near a position to press the button, and it's one massive touchscreen "End Call" button at the bottom. I've never, ever had trouble with this. WP7 should be able to fix this in software, right? So Microsoft Fixed Local Search? It's good that Microsoft got local search working but will they ever fix the iPhone and Windows Mobile 6.x versions? On both, a local search always shows places 2-5 miles away and sorting by distance always does nothing. You usually have to scroll down and click on "more..." several times to find a place nearby. I'm in Philadelphia and wanted to find a post office. It onlyu showed places in New Jersey and after scrolling through several; pages, I found one a half mile away but in fact there is one only 2 blocks from where I was standing and it has been there for at least 25 years! Too bad Microsoft never fixes bugs as I reported this over a year ago and frequently since. I wonder when they will stop updating the WP 7 apps and operating system??? I wouldn't hold my breath - Windows Phone 7 has more in common with a Zune HD than it does with any previous Windows Mobile phone. Although clever people do tend to find a way to accomplish certain things, so who knows. But I think the days of registry hacking and whatnot are likely behind us (for better or worse). From my very early days with WinMo (Motorola MPx-200 anyone?) on through to v6.5, the appointment snoozing function is something that has always defaulted to only delaying the alarm another 5 minutes. I've always had to fix it with either some third party tool or a few registry judo chops. Android has the same "issue" but there is a great couple apps that handle it well. I have never used an iPhone and never integrated my dear old gen 2 iPod Touch with Outlook, so I don't know if it exists there also. And I doubt it will ever be addressed because it isn't a glory feature, so it isn't going to get any love.